Welcome! 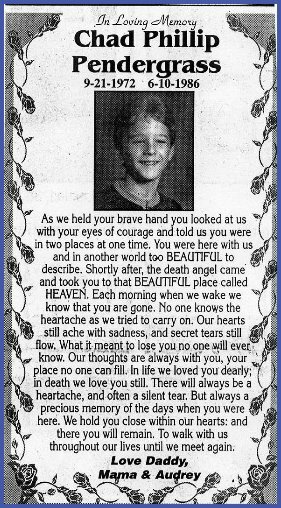 Please meet our beloved son, Chad, and learn how his life impacted so many other lives. Chad Phillip Pendergrass, 13, an eighth grade student at Henderson Junior High and a resident of the Cokesbury community, died this morning at Duke Medical Center. He was born in Vance County on September 21, 1972, and was the son of Phillip and Carole Powell Pendergrass. The funeral will be at 2 P.M. Thursday at Gillburg United Methodist Church by the Rev. Wade Crabtree and the Rev. Frank Sossamon. Burial will be in Sunset Gardens. Surviving, in addition to his parents, is one sister, Audrey Pendergrass, of the home; his paternal grandmother, Mrs. Lee Allen Pendergrass of Norlina; and his maternal grandfather, Paul Powell, of Lock Haven, PA. The family will receive friends at Flowers Funeral Home from 7:30 to 9:00 P.M. Wednesday. The body will be taken to the church one hour before the funeral service. Pallbearers will be Kevin Pruitt, Glenn Strum, Steve Fisher, Tom Peoples, Chuck Pendergrass, Johnny Patterson, Jimmy Allgood, and Tuan Tran. Honorary pallbearers will be Chad's eighth-grade classmates at Henderson Junior High School. 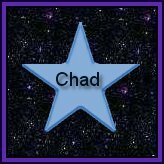 Click on the following star to view Chad's star on the Heavenly Lights Children's Memorial list. I would love to have your comments in Chad's Guestbook! You may visit Robbie's Mom's homesite by clicking on this logo.